Joe started his professional career in 2000 with Intercontact Services and his banking career in 2004 with Santander UK, formerly Abbey National Plc, a UK-based bank. In Santander, he was a lending consultant with a focus on retail lending. He joined Finbank, then a subsidiary of Access Bank Plc, Nigeria, in 2009. 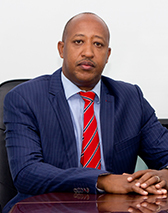 During the last 6 years with the bank, he has managed several business portfolios including retail, commercial, corporate and institutional banking. He brings on board a decade of banking experience, spanning over portfolio management, risk management; sales and marketing; strategy formulation and execution, relationship management. In his current role, Joe is responsible for growing the bank’s overall business particularly the bank’s asset and liabilities. He leads a focused team of RM’s and banker’s to achieve the bank’s growth targets. He holds a BSc in Economics and a Masters Degree in International and Development Economics and a professional Diploma in Business Banking from The Chartered Institute of Bankers in Scotland, UK. He has also accumulated professional trainings in Financial Management; Business Finance; Risk Management; Investment; from Worldwide Leaders in Learning Solutions such as Thompson Reuters and ACI. Samora joined Finbank in 2014 as Enterprise Risk Manager, prior to that he was an Investment Manager at Dillux SA, a Mauritius based private equity fund. He has worked in the fields of finance and investment with NIC Banking Group as a research analyst and Zimele Asset Management as an analyst covering the money market funds. He has experience in understanding risk and mitigating any adverse risk outcomes. He has also developed a lot of hands on operational experience with Dillux SA. Within Finbank, Samora is responsible for the overall management of risk at Finbank including operational risk, funding risk and reputational risk. He has a key role in the development of new banking channels as well as banking relationships. Samora holds an MSc in Economics and Financial Economics from The University of Nottingham in the United Kingdom. He also holds a Bachelor of Business and Commerce with an Economics major from Monash University in South Africa. He has undergone trainings with Lattice Consultants in financial modeling and corporate finance. 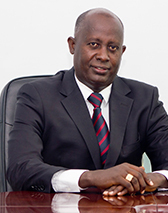 Willy Cimba is the Head of Liabilities and Recovery. He has held this position since 2014, prior to this he was the head of public sector at Finbank. Cimba has extensive experience in the local banking sector after working in various roles in different banks across the country for over quarter a century. Prior to joining Finbank, Cimba was head of institutional banking at BCB with a mandate to serve NGO’s, donor agencies and international institutions. He was also overseeing branch co-ordination. He was also in charge of business development, leading teams to Europe to develop BCB’s remittance business. Within Finbank, Cimba is an executive officer with the mandate to grow the bank’s liabilities, create new product lines and develop new banking relationships. He also has the mandate to lead the bank’s recovery efforts on its outstanding loans portfolio. He does this by overseeing all the business officers including Branch managers as well as the recovery team. Cimba has plenty of experience and professional qualifications including advanced diplomas in marketing, audit and control from France. He also has an ACI certificate in dealing obtained from Lagos, Nigeria. He has lead teams to Sweden, Netherlands, Kenya, France and Belgium to develop new products. 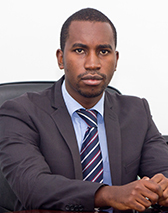 He is a key member of staff and is valued for his experience and deep knowledge about the Burundian banking industry. Agnes Misago joined FINBANK SA in 2009 as Head of Global Trade Unit. 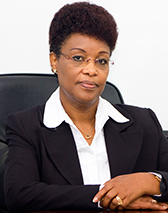 Agnes has had a long career in the Burundian banking sector as she previously worked in BGF S.A (Banque de Gestion et de Financement) for 13 years from 1996 to 2009. Before leaving BGF, she was the legal team lead officer in the bank’s Business Unit. Before that she was in the international banking division as head unit. She has vast experience in bank operations particularly matters concerning trade regulations and international banking. In her current role, she is responsible for monitoring and coordinating the Bank’s operations particularly, branch operations and back office treasury administration. As head of Global Trade operations, she supervises all international money transfers, MT messages, LCs on the SWIFT platform and authorisation of daily teller transactions. Furthermore she is in charge of ensuring strict compliance with the bank’s standard operating procedures, policies and regulatory prescriptions. Agnes is graduated in Law from University of Burundi and has conducted numerous trainings in international banking, SWIFT and bank operations. Beatrice Ndabakubije holds a degree in law from the&amp;amp;amp;quot; Université Libre de Bruxelles (Belgium) and has over 30 years working experience in legal posts. 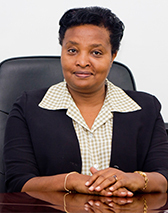 She began her professional career as the Head Legal to the office of the Managing Director of the Burundian Textile Company of Bujumbura, “COTEBU” (currently AFRITEXTILE) for 12 years (1984-1996), and then was appointed Administrative and Commercial Manager to “GEBUPHAR”, a Burundian private-run drugstore company, for 7 years (1996-2003). She joined FINBANK S.A. in 2003 as Head of Recovery and served the bank for 11 years under different managerial positions including Human Resources, General Resources Management. As Head Legal and Company Secretary, her responsibilities are focused on the effective and efficient management of the Legal department, provision of legal advisory services, ensuring effective management of legal and contractual risks, litigation management, and regulatory compliance. She is also responsible for the organization of Board and its Committees and General Assemblies of shareholders and is acting as Secretary to those bodies’ meetings.